"When I first entered a coffee shop with some friends, they suggested the avocado milkshake. It sounded gross at first but I found it was actually very sweet, smooth, and creamy. Don't pass this smoothie up. Serve with whipped cream on top." 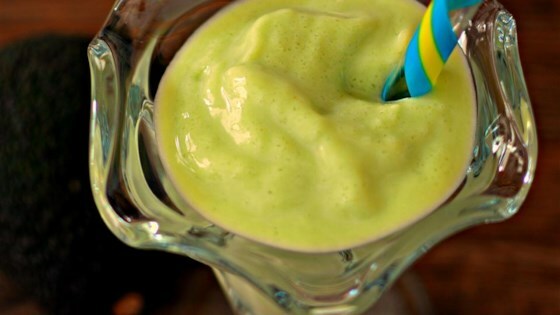 Combine avocados, ice cubes, milk, and sugar in a blender; blend on medium speed until smooth, 3 to 5 minutes. Pour into serving glasses. A decadent, dessert-worthy shake with chocolate hazelnut spread and coffee. If there is any left over, simply freeze it and microwave for 15 to 30 seconds before serving. Surprisingly good flavor with a thick milkshake texture.